Holiday Cottages Cumbria’s website has been redeveloped, it’s now mobile friendly and major improvements have been made to the design, usability and SEO. The design now features a large image slider containing photos of the cottages and Lakeland vistas. Six smaller images sit under the slider and link through to targeted search terms, such as ‘Romantic breaks’, ‘Luxury cottages’ and ‘Pet friendly cottages’. 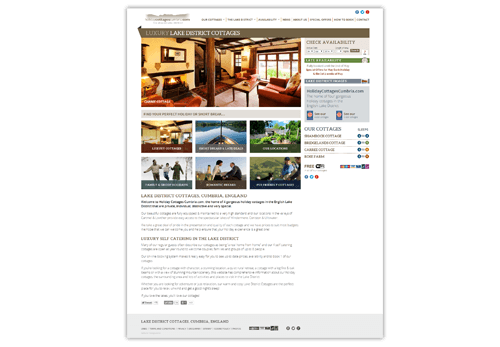 Above the website’s fold are links to ‘Check Availability’, ‘Late Availability’ and ‘Lakeland Photos’. These three pages are key to converting browsers to bookers and link directly to online bookings, seasonal special offers and beautiful images of the Lake District. In terms of SEO and usability, the site contains an interactive map of Cumbria and 50 must visit places in the Lake District. Both these pages enhance and increase the site’s content and are an important part of the client’s SEO strategy.